Many women are prescribed Bioidentical Hormone Therapy (BHT) to relieve symptoms of menopause, such as hot flashes, insomnia, depression, osteoporosis and heart disease. At SFNM we are experts in BHT. We know the latest research. We have considerable firsthand experience. We can help you determine whether BHT is right for you, or whether the best course of action is to rebalance your hormones without the use of BHT. Bioidentical or natural hormones are biochemically and molecularly identical to human hormones. They provide the benefits of hormones without the drastic and troubling side effects that can occur with the synthetic hormones used in conventional BHT. 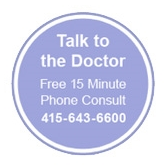 Our experienced doctors will carefully assess your situation. If hormones are the best option, you can be confident that SFNM is one of the leading centers for Bioidentical Hormone Therapy. We have the critical experience to identify the exact bioidentical hormones that your system will tolerate best without damaging side effects. You will receive the precise chemical combination you need at a safe dosage most appropriate for your age and symptoms. It's important to know that BHT is not only for women. Many men experience symptoms of andropause such as fatigue, low libido, poor stamina, depression and erectile dysfunction. These symptoms may be due to low testosterone and other androgenic hormone deficiencies. Our doctors can review your symptoms, test your hormone levels and determine if BHT is right for you. In addition to hormones, our doctors are skilled in utilizing a wide range of natural therapies to alleviate menopausal symptoms. Using a combination of diet, exercise, lifestyle and stress management, as well as high quality nutritional supplements, herbs and acupuncture, we customize treatment plans that deliver relief from common menopause symptoms. Many women come to us for expert advice on relieving menopausal symptoms, and BHT can be an excellent option for a large number of them. However, our experience also indicates that many women can manage their menopausal symptoms without using natural or synthetic hormones. Whether hormones are best for you or not, we have the expertise to accurately assess your situation, help you make the right choice, then expertly and safely guide you to treatment with maximum symptom relief and minimal side effects.